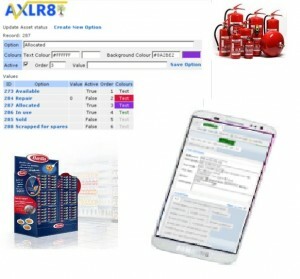 AXLR8 Equipment Tracking now allows you to track assets (yours, your clients’, loan/lease equipent, etc.) by location, test history, asset number, owner, etc. Make sure every mobile and branch/HQ worker has the equipment they need. Run reports of what needs to be PAT or PUWER tested, etc. Locations can include vehicles which are treated as mini-warehouses to make life simple. Vehicles may also be tracked for their own testing such as MOT and other regular safety and manufacturer recommended servicing. Asset lists for Financial Accounting or for insurance reviews are a click away. Inspections of equipment for your staff on site can be shortened by having all the paperwork automatically up-to-date. Sighn in/ out sheets – book it out and check it back in! History of the equipment (service, damage repairs, notes, pictures, sites used, etc) is kept in as much detail as you require. Never have a job delayed because the equipment is mislaid or because a repair that could have been done yesterday simply did not get done. Call AXLR8 to ask for more details. You can also click here for more information on Asset Tracking.